The protection and governance of their personal and business wealth is a major concern for many high net worth individuals and their families. The absence of an effective governance and family office structure and the failure to plan for the cross-generational transfer of wealth are two of the main causes of the dissipation of wealth over two or three generations. 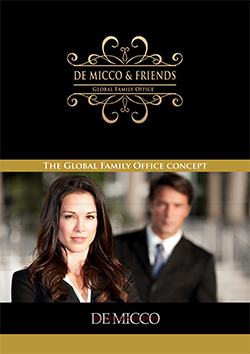 De Micco & Friends offers individual, legal, financial and well-structured solutions and support. De Micco & Friends lawyers work hand in hand with their auditors for wealthy individuals and their families to develop and implement wealth structures which take into account their values and philosophy and provide flexibility for changing circumstances. For families whose wealth is built on a family-owned business it is essential that careful consideration is given to succession to the management of the business and the devolution of the control of the business and the economic benefits derived from the business. Sometimes it is desirable to separate control from economic ownership and we can advise on the alternative structures to achieve this. De Micco & Friends works closely with the founder or other key individuals to ensure that appropriate structures and strategies are in place to ensure the continuation of the business after the founder’s retirement or death. To develop an effective financial strategy for wealth structuring, we invest time with each of our clients and their advisers. Unlike many other trust companies, the structures we create can protect both financial and non-financial assets, from businesses and foundations to yachts, art and property. Over time, we proactively monitor developments in international planning, tax and other legislation. This helps to ensure that our clients’ wealth structures remain relevant, robust and effective. 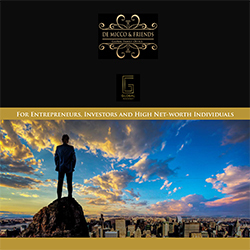 De Micco & Friends offer a comprehensive range of wealth structuring services, including guidance and recommendations on the latest techniques and opportunities. We also help our clients with broader issues surrounding family governance and planning for the future generations. When structuring our clients’ assets, we do it by using a wide range of vehicles – including trusts, foundations, insurance and corporate vehicles – and specialise in advising international families whose affairs span a range of domiciles and jurisdictions. Through our philanthropy service, we also provide our clients with advice on the most effective ways to give money to charitable causes, helping them navigate the wide range of available options. Specifically, we provide independent guidance on legal and accounting vehicles as well as on setting up a broad framework for charitable giving. Our lawyers and auditors advise high net worth individuals and their families on all aspects of their personal and business wealth, including wealth structuring, tax planning, governance, all family office issues, trust, foundations, dispute resolution and tax and trust litigation. As well as designing and advising on appropriate wealth structures we consult on international tax and estate planning, business succession planning and international wills and estate administration. De Micco & Friends designs, establishes and advises on international asset holding structures (for business and personal assets) for high net worth individuals and their families which meet their tax and non-tax needs and provide flexibility for changing circumstances. These range from contractual arrangements or just simple trust and corporate structures through to complex structures involving a number of different vehicles - such as trusts, foundations, private trust companies, limited partnerships and family offices. If you have any assets outside of your country, it is highly recommended that you instruct a lawyer qualified in the relevant country to advise you as to what would happen to these assets when you die. If necessary, the lawyer can then assist you in making a Will to ensure that your assets are dealt with as you would wish after your death. It is highly recommended that you seek legal advice in each country in Europe in which you have assets so that you may plan the succession of your assets to ensure that they will be dealt with as you intend. Laws relating to inheritance vary significantly from country to country. De Micco & Friends will be able to work alongside your local lawyers and tax advisors to enable you to plan the succession of your worldwide assets. Our lawyers and auditors advice clients on all aspects of personal taxation including, tax efficient investments, tax efficient remuneration, changing tax residence and domicile planning, pre-immigration tax and wealth planning as well as emigration planning. De Micco & Friends advices on international tax and estate planning, exit strategies, business succession planning and international wills and estate administration. The auditors advise individuals on tax efficient philanthropy as an element of their lifetime and estate planning, including establishing charitable structures and other fundraising ventures. Private clients get an advising on the tax situs, source and personal tax consequences for investors of a broad range of investments - including bonds, hedge funds, structured products, life bonds and other insurance products. Settlors and trustees get an advising on all aspects of trust law - including trustees’ duties and obligations, trust construction, trustee decisions and the rights of beneficiaries. We consult also trustees and foundations on changes in tax legislation which impact on the trust, foundation or the beneficiaries and on compliance issues. In the case of the conflicts of laws between different jurisdictions - for example, in relation to succession, forced heirship rights and community of property rights on marriage De Micco & Friends advice the parties.